Mets Free Agents: Who Would You Keep? The Mets have signed free-agent pitcher and former Flushing farmhand Kevin Mulvey and assigned him to minor league camp. 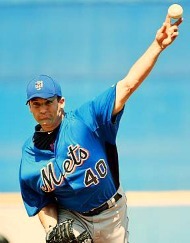 You may remember that the NJ native was part of the trade that brought Johan Santana to New York. Interesting, Mulvey was also traded for current Met Jon Rauch — from the Twins to the Diamondbacks. Though his future looked bright when he left the Mets organization, Mulvey hasn’t exactly set the world afire. He’s appeared in 10 MLB games, including 4 starts, and owns a 7.90 ERA and 1.76 WHIP with 19 strikeouts and 14 walks in 27 innings. He was so-so pitching in the International League in 2008 and 2009 but was roughed up in his last two years in the hitter-happy PCL, posting ERAs over six and a half. Mulvey turns 27 in late May so he likely “is what he is” at this point. But, I like the signing as the Mets need some starting depth at AAA. And it’s always nice to see a former prospect come back and try again. In other news, another local, C.J. Nitkowski of Suffern, could be signed by the Mets as well. Nitkowski worked out for J.P. Ricciardi and Dan Warthen, sporting a new sidearm delivery that reportedly was modeled after Pedro Feliciano‘s. The 39-year-old Nitkowski spent 5 years pitching in Asia and hasn’t been in the big leagues since 2005, when he was ineffective in 7 games with the Nationals. Considering that Tim Byrdak is on his way to NYC to get his knee checked out, it can’t hurt to give the new-look LOOGY a shot. By the way, also heading to NYC for examination is David Wright, who has not made any progress with his injured rib cage muscle. Hopefully this rib cage thing won’t turn into an extended issue. Although many Mets fans were sad to see “Perpetual” Pedro Feliciano leave Flushing, in retrospect, that move couldn’t have turned out better. For one, the five years of abuse the Mets put on Feliciano finally caught up to his arm. Second, as a fourth-place club, an expensive LOOGY really wouldn’t have made a difference. And third, there was Tim Byrdak. Personally, I was not all that impressed with Byrdak’s 2011 season, but everyone else was so I’ll defer to the masses; perhaps I missed something. The 37-year-old lefty appeared in 72 games, posting a 3.84 ERA, 1.40 WHIP, and a 2-1 record. His supporters speak excitedly about his 11.4 K/9 rate — which I admit is outstanding. However, he also had a 4.5 BB/9 rate, which is far from outstanding. He was excellent in stranding runners on base — only 16 of 67 inherited runners scored, or 24%. He was hired to shut down lefthanded hitters, and he did a good job at that, holding them to a .222 batting average and a .604 OPS. However, MLB also allows hitters to bat righthanded if they so desire, and when that opportunity was exercised against Byrdak, the results were a .279 AVG and .857 OPS. Am I nitpicking by pointing out Byrdak’s propensity to walk hitters and his inadequacy vs. RH hitters? Maybe. But the reason I’m not as high on him as others has more to do with inconsistency through the season. Byrdak had a really, really good run in June and July — ironically, the two months when his strikeout rate was at its lowest. He began the season poorly and finished uneven. Don’t get me wrong — I don’t think Byrdak was awful, I just don’t believe he was anything special. But, part of that has to do with my old-school mentality of being opposed to one-out specialists. I believe a team is better served using a precious roster spot with a pitcher who is effective against batters of both sides — particularly on a team that is in rebuilding mode. In September, Byrdak’s contract was extended through 2012, so there’s at least one of the 25 spots on the roster locked up. I don’t know why a team destined for another non-contending, rebuilding season and in financial straits needs to spend money on a LOOGY, but again, the masses found this to be a “smart” move so I’ll step back and let them enjoy the moment. With Pedro Feliciano moving on to pitch for the Yankees, the Mets have brought in a so-so selection of lefties to audition for his LOOGY spot: Michael O’Connor, Taylor Tankersley, and Tim Byrdak. You might even throw Chris Capuano, Oliver Perez, and Pat Misch into the conversation, as well as minor leaguers Roy Merritt, Eric Nieson, Mark Cohoon, and Robert Carson. Crazy, right? But in the deep dark winter, irrational, unrealistic thoughts tend to enter my mind. I’ve even thought my joke post to reverse the game could be considered seriously. The idea is that Davis would be able to enter an inning on the mound to face one lefthanded hitter, then go to first base when a righty came up, then return later that inning or later in the game to face another lefty. Using Davis as a LOOGY would open up a roster spot, and allow the Mets to set up more lefty-lefty matchups in a game. Think about it: bringing in a LOOGY to face Ryan Howard and Chase Utley not once a game, but twice — or three times! Or, bringing in a LOOGY, only to have the opposing manager counter with a RH pinch-hitter, and then slipping in a ROOGY to counter-counter — while still keeping your LOOGY available because he’d be moved to 1B. Of course, there are some issues to work out, such as getting Davis enough warmup pitches prior to the inning in which he’d be used. Oh, and then there’s the small matter of whether he’d be good enough to retire MLB hitters. Davis had realistic expectations of going in the first round, both as a pitcher and hitter coming into the year, but he had a disappointing spring, in both roles, as Chaparral won a third straight state title. While he has excellent bat speed and continued to hit for average (.447), he drove balls only in spurts, which magnified his lack of speed and athletic ability. His velocity also slipped. It settled into the high 80s this spring after being 87-91 and touching 92 in the past. But he still gets exceptional movement from a three-quarters angle. Scouts are split on where to play Davis, but most see greater upside on the mound. His father, on the other hand, wants him to be an everyday player. 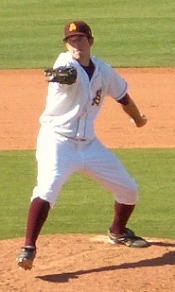 The debate could benefit Arizona State, which recruited him to play both ways and has penciled him in as its starting first baseman for 2006. I didn’t see him pitch at ASU, so have no idea whether he had big-league stuff. From what I’ve heard, he threw at least in the low 90s during his junior year, but don’t know what he did for secondary stuff. If he threw in the mid- to high-90s, he wouldn’t necessarily need other pitches in a LOOGY role (but then, he likely wouldn’t have been drafted as a first baseman, either). It’s been only a little over two years since Ike Davis last pitched competitively, so he wouldn’t have too much rust to shake off. Why not put him on the mound and see what he can do? If he can find the plate with his fastball and mix in a slider, he’ll have enough to be a LOOGY. In spring training, have him spend about 15 minutes to a half-hour a day throwing off a mound under the close watch of Dan Warthen. What’s the worst that can happen? Hat tip to Murph, who inspired this post by his comment over the weekend.